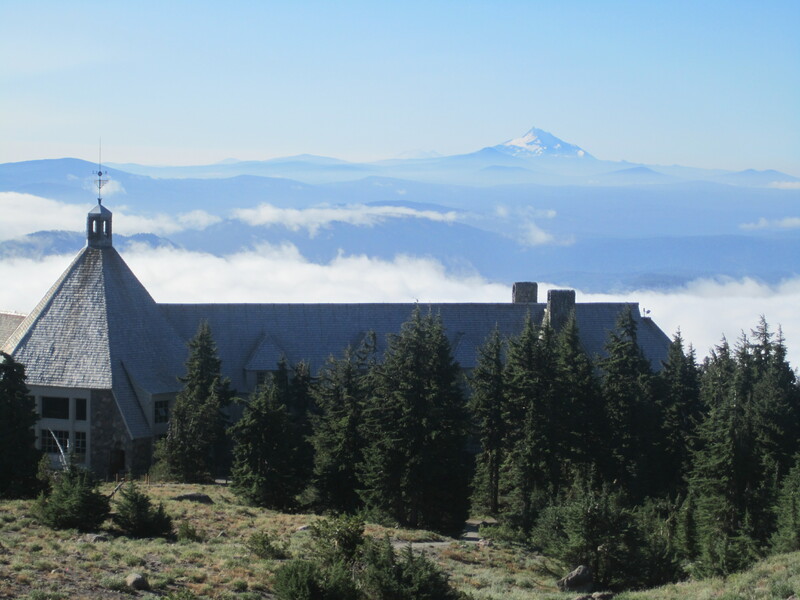 The easiest way I know to get to elevation in Northwest Oregon is to drive to Timberline Lodge. 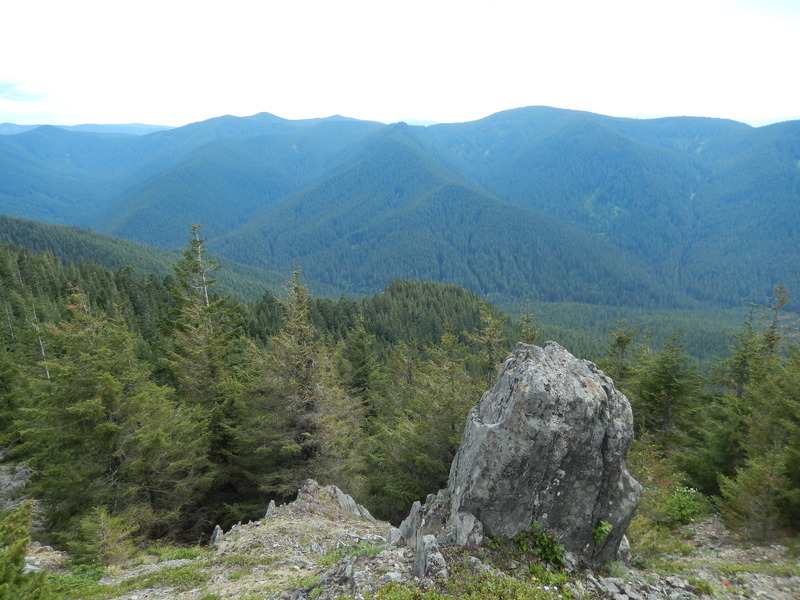 The second easiest way is to hike to McIntyre Ridge or Wildcat Mountain from the west. The access road is paved until the very end, and you get a three thousand foot elevation headstart on most trails in the area. The area used to be more popular with dirt bikers and target shooters, but access and the rules have changed. It is less noisy than fifteen years ago, but target shooters still find spots to practice their skills. The start of the trail winds around an old quarry-like area, the far side of which drops off into a canyon for great views. 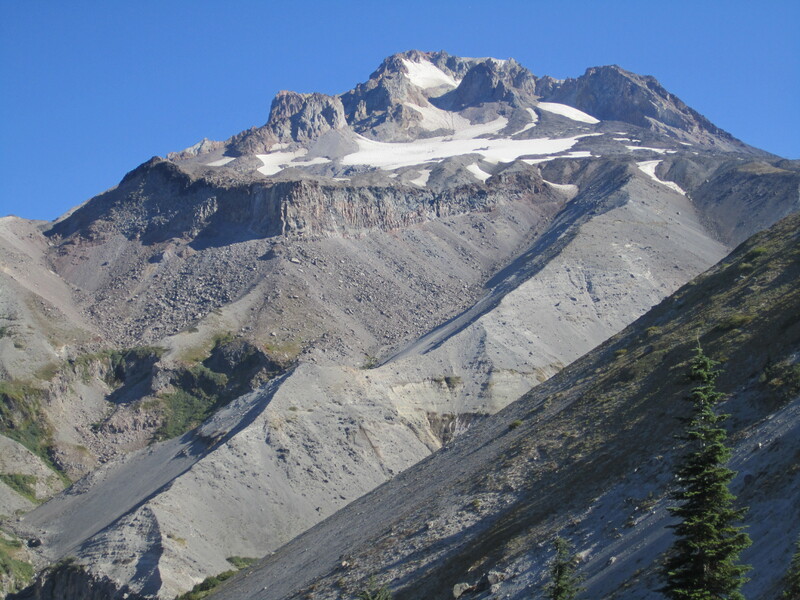 The trail climbs briefly, then levels off at a spectacular promontory with views over the Eagle Creek drainage–unrelated to the more famous Eagle Creek in the Columbia Gorge. After a mile of casual uphill walking, there is an unsigned junction. Most people head left here, the way to the unassuming but beautiful high point along McIntyre Ridge. 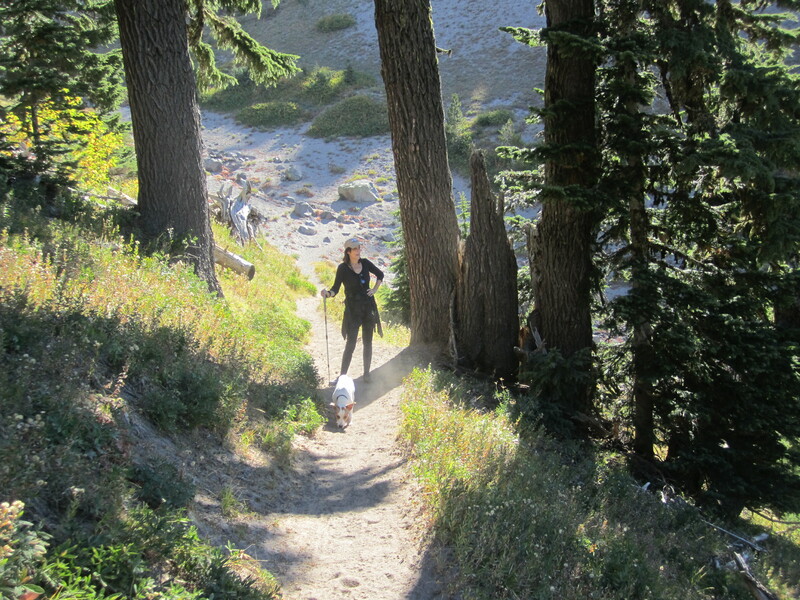 I found a few other hikers out there taking in the pretty forest and the view so the always dramatic Mount Hood. A man sat on the bench installed there years ago as a tribute to two men who loved the area. I wandered around the ridge for a while, then turned back. I had more destinations in mind. At the junction, I headed left, or the other way, on the Douglas trail. The trail soon heads up through some switchbacks. 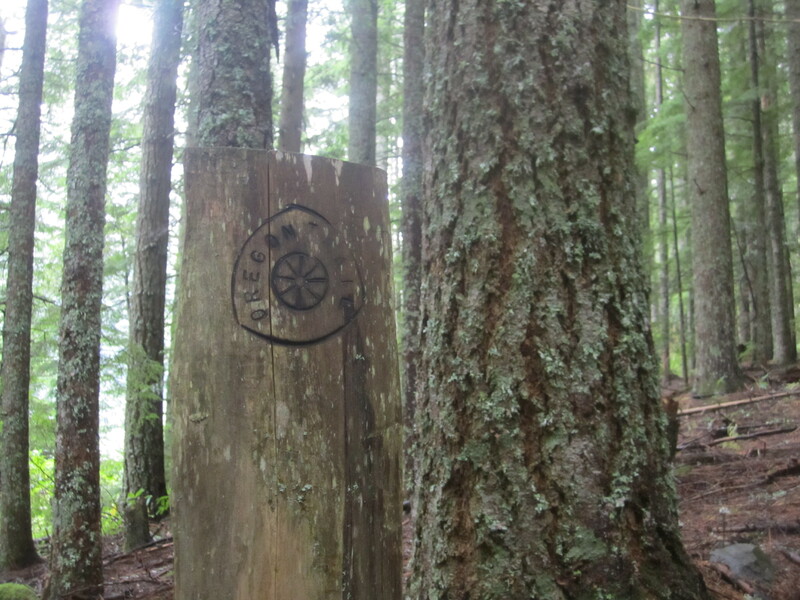 At the high point, there is another unsigned trail to Wildcat Mountain itself. This is another modest peak with almost no views, but I scaled it anyway. The peak is anticlimactic. Views can only be had by peering through trees. The best part of the hike, however, was yet to come. I remember continuing east on the trail more than a decade earlier in connecting to Huckleberry Mountain. There is a spot on the narrow ridge I wanted to find. 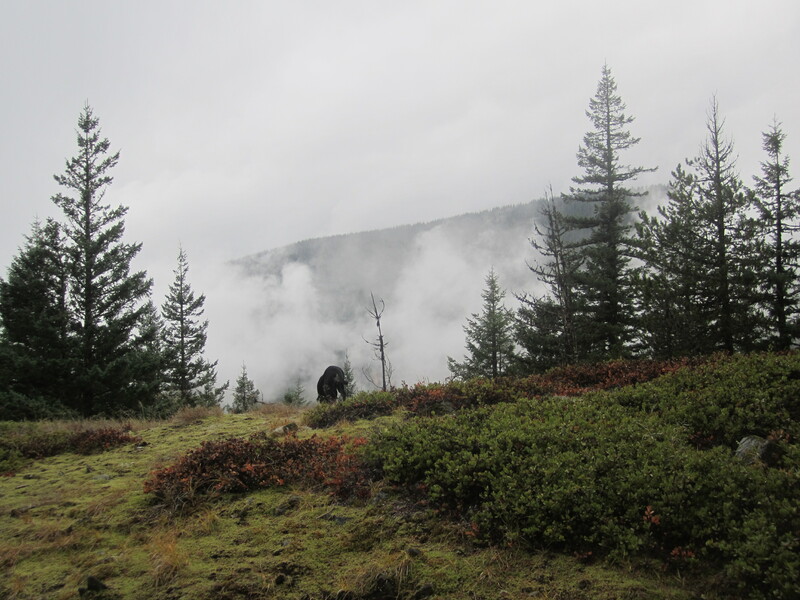 I dropped back down to the Douglas Trail, and fifteen minutes later, I emerged on the open rocky ridge. Clouds had started to move in, but I could still see Mounts Hood, Adams, and Jefferson as well as many foothill peaks and the Eagle Creek and Boulder Creek valleys. It’s a gorgeous green spot in all directions, and not a soul in sight. Just my kind of place. I sat there for a while contemplating the state of the natural world and then hiked back to my car, more than satisfied. On Sunday, I visited an elderly friend in my former hometown near Mount Hood. We enjoyed a delectable meal at the Resort at the Mountain, which offers some of the finest restaurant views I’ve ever seen. Some people sat out on the large patio. Even inside, there is a view over the golf course towards massive forested ridges which define the green Salmon River valley. Not bad. After our meal, we drove to the Lost Creek Campground. This is often less crowded than other campsites in the region, and it also offers a short nature trail with interpretive signs. 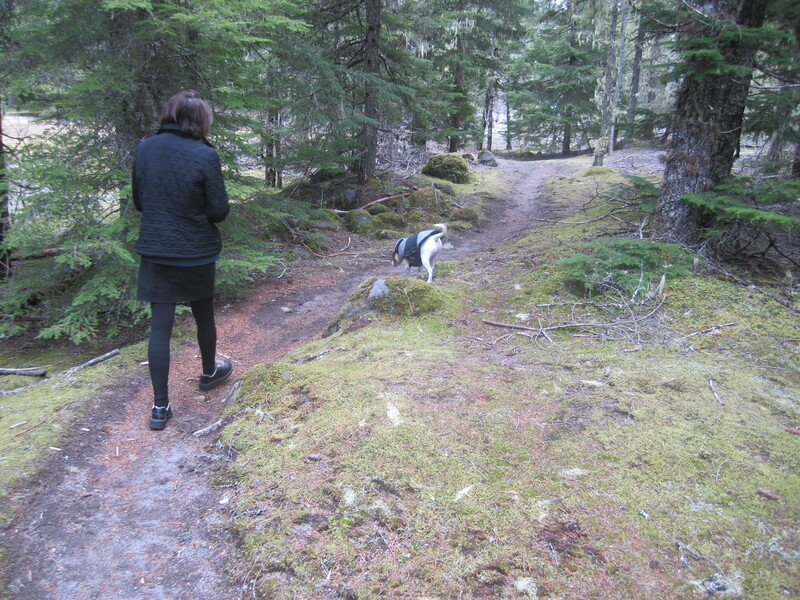 Part of the path is paved, although the massive firs and cedars in the area have buckled some of the pavement. The so called beaver pond, where, ironically, the view is now towards many alders that would have pleased the beavers. It was fascinating to once again realize the power of volcanic eruptions and how it shaped the landscape. 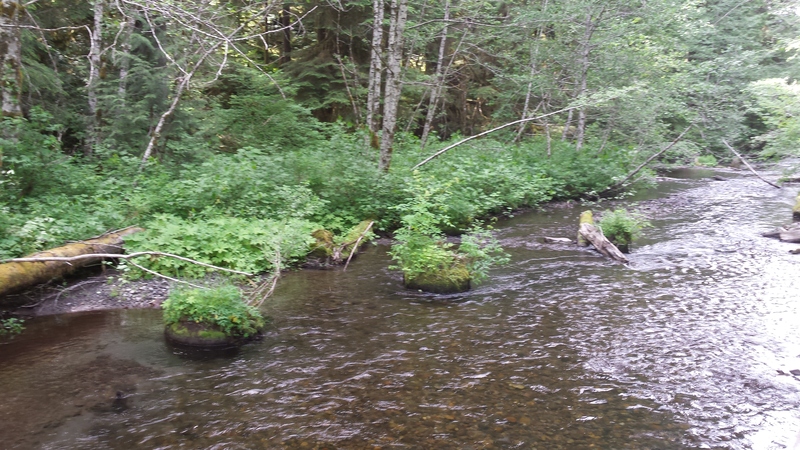 Volcanic mudflows emanating from Mount Hood in the 18th century changed the floor of the area ecosystem and preserved stumps of old trees right in the creek bed. What a wild world. At the end of the path, we sat on a bench in front an old beaver pond. 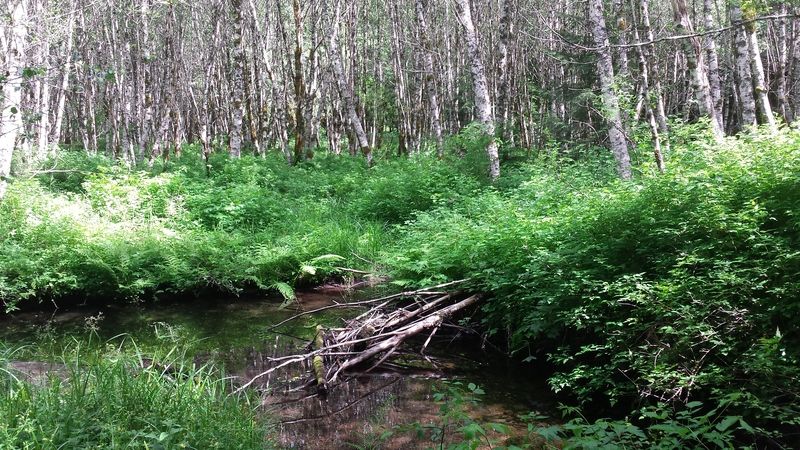 The beavers have vanished in recent years, ostensibly to find better trees to eat. 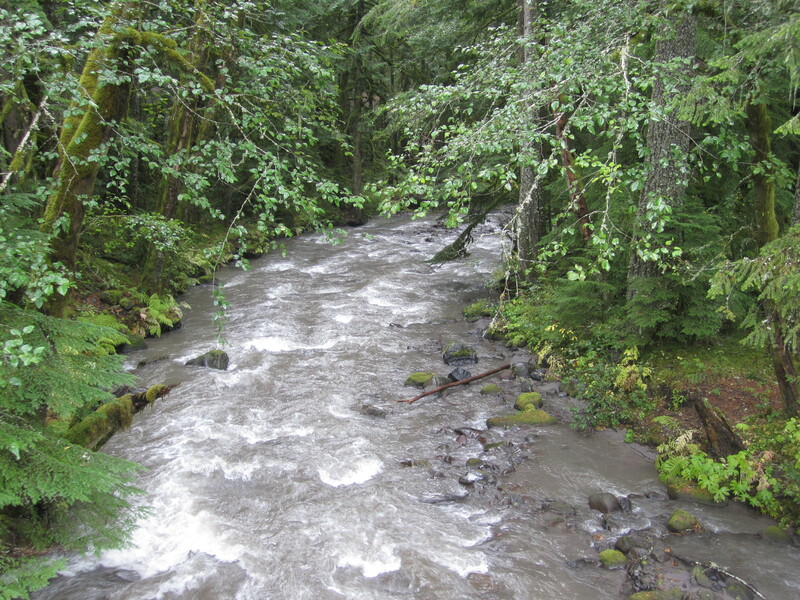 I hadn’t been to Lost Creek in at least four or five years. It’s a gorgeous, peaceful place to spend an afternoon with an old friend. 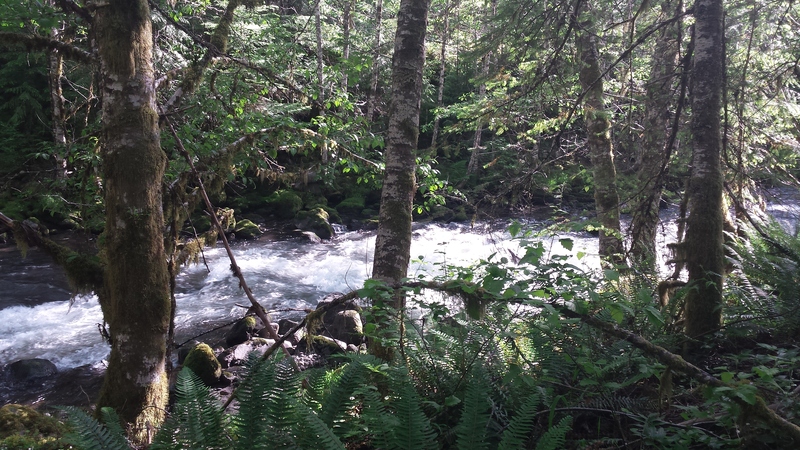 Here’s a little view into the gorgeous forest on the west side of Mount Hood where I took a walk with my wife recently along the Zigzag River. 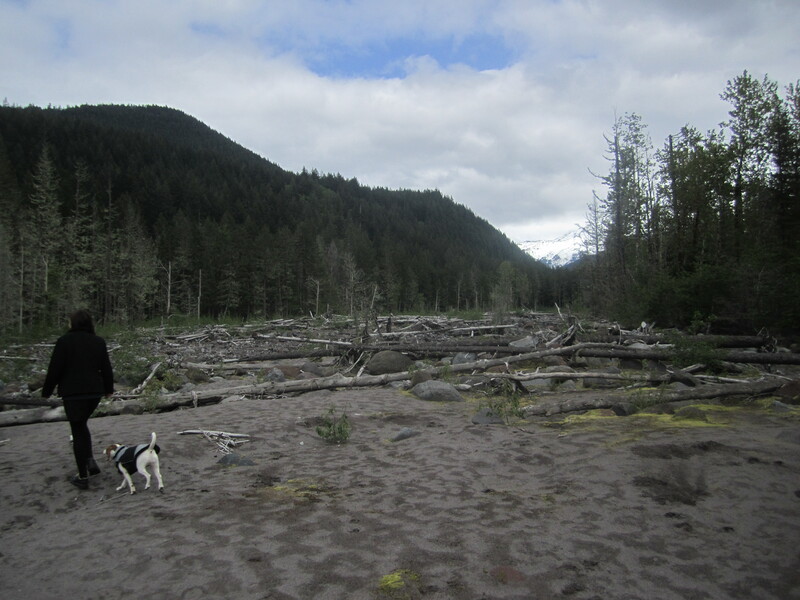 We started out on the Pioneer Bridle Trail and then veered off on an unofficial spur that cuts back along the riverbank. 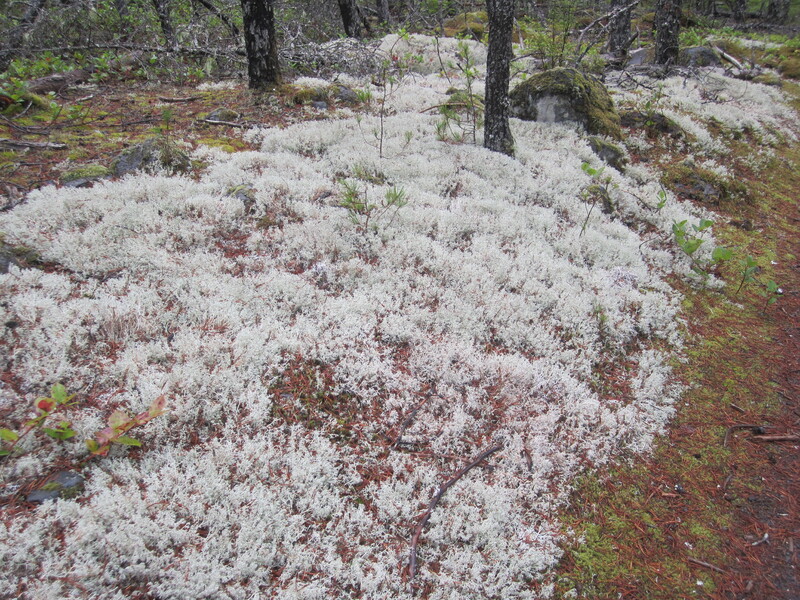 The path is overgrown in spots, but that made it more adventurous. For some reason I found myself poring over old photos tonight. Flashback to two summers ago. 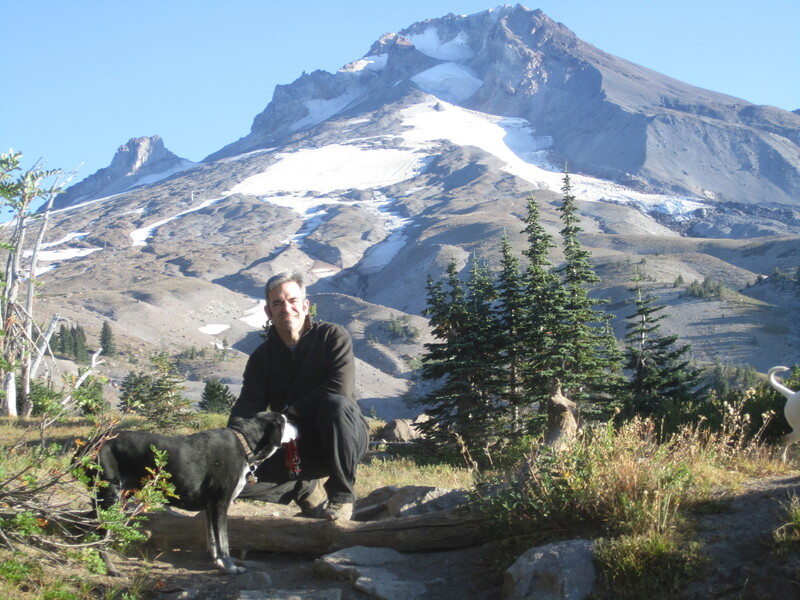 I hiked up the Salmon River Trail with my friend Steve, who toted his infant daughter on his back. 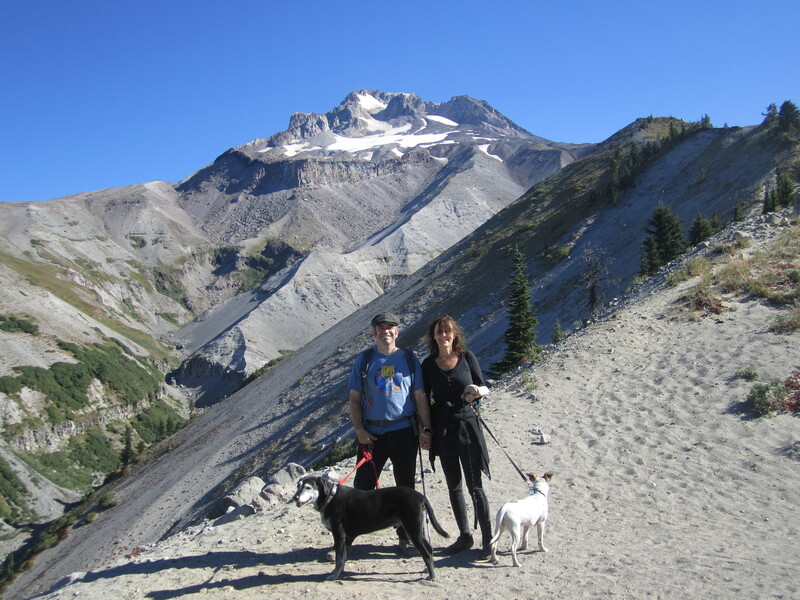 There are couple great lookout points on the trail including this one. After hiking a bit over an hour to get there, we sat and enjoyed the views and each other’s company. Glorious day. 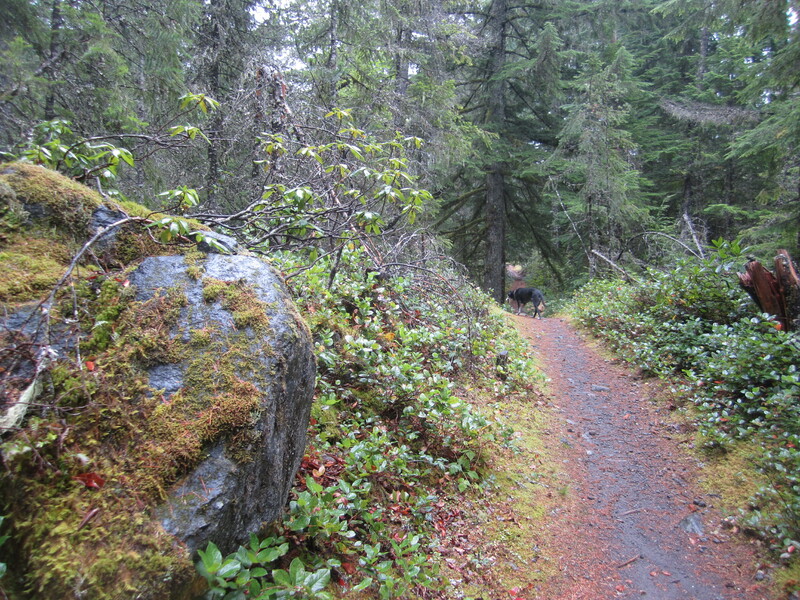 The section of the Pioneer Bridle Trail north of Highway 26 (between Rhododendron and Government Camp, Oregon) has a vastly different feel than the one I wrote of a week ago. Like the other section, it receives little traffic, but this area is much hillier and has denser woods. There are few obvious destinations beside an old mineshaft, but there is nice second growth forest, and on a gray day, this is still a worthy area for a hike. 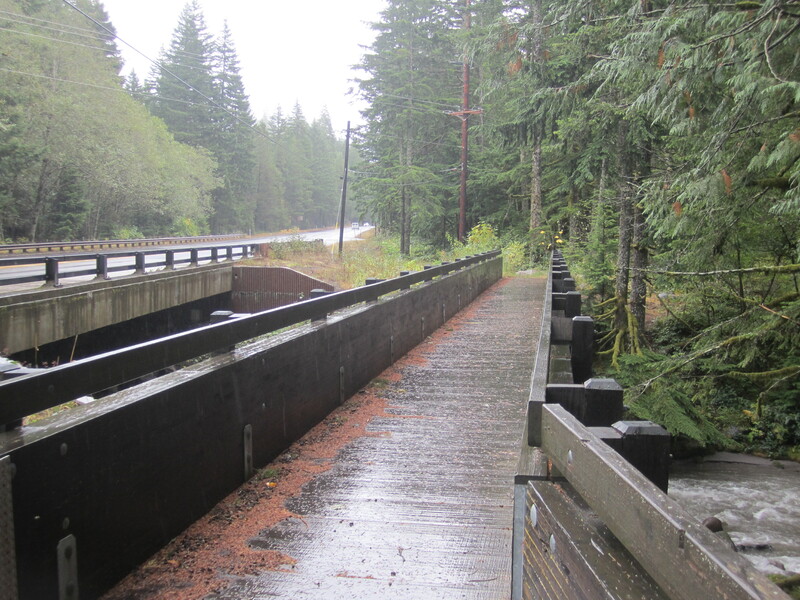 Yesterday I began hiking at the east end of Road 39, which locals call Kiwanis Camp Road, although a start at the west end of the road, right where the trail crosses the highway, gives a better workout. When I arrive with Niko at the trailhead, I spy a photographer setting up a shot alongside the stream, presumably looking at the colorful leaves. I almost talk to her, but I don’t have a leash for Niko, so I think better of it and move on, across the water, onto an old road. A couple hundred yards uphill, the road peters out and the bridle trail cuts beneath it. I peel off and head west toward the mine. 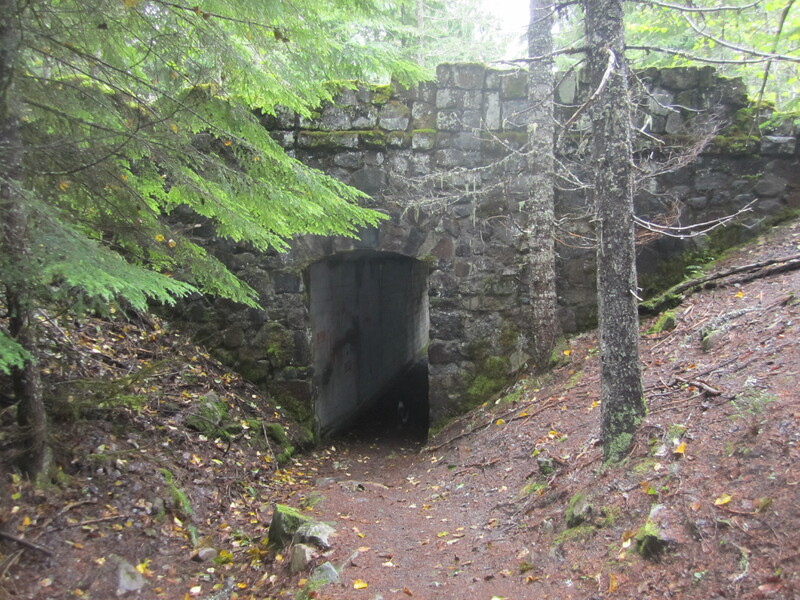 The underpass at the beginning of the trail. The walking is always pleasant. One unique aspect of this area is the signage of the actual Barlow Road. 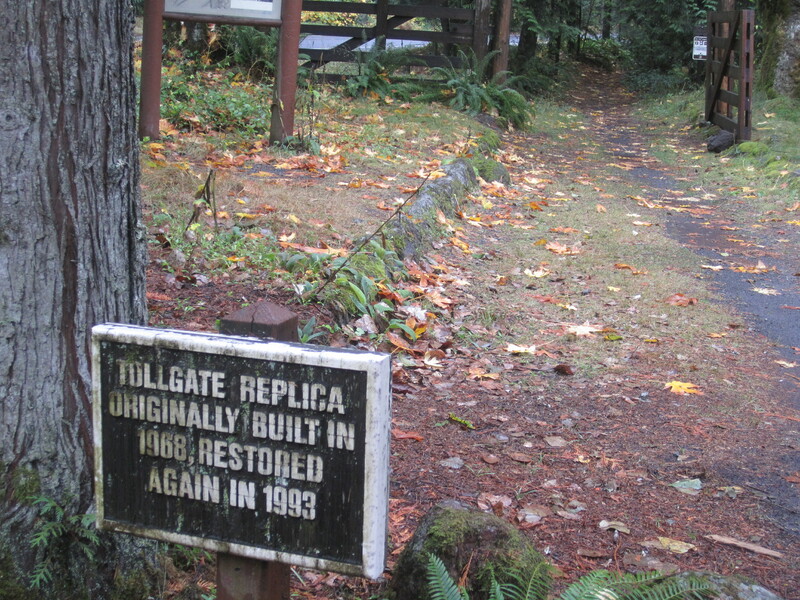 History buffs have flagged spots where they have seen evidence for the old wagon road, and there are a couple wooden signs if you know where to look. The mineshaft is a gaping maw straight down. Fencing is there to keep the clueless from hurting themselves. 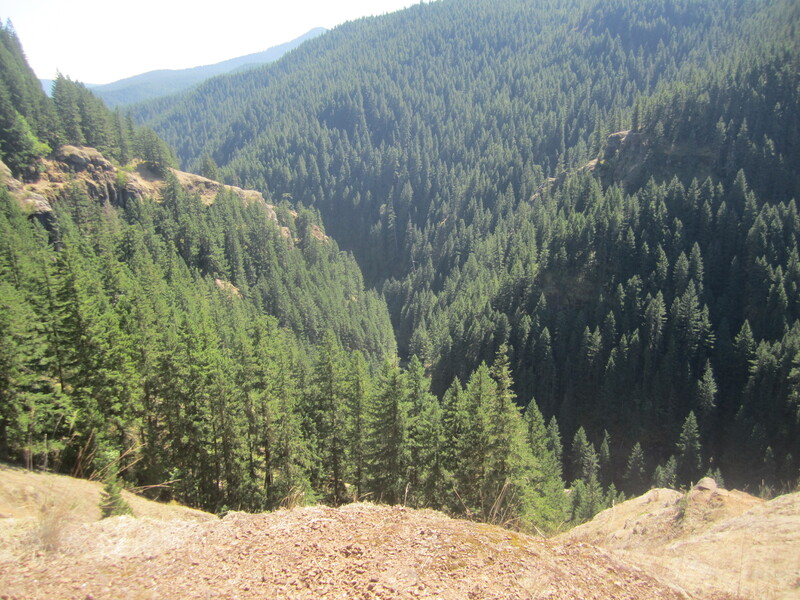 If you really want to check out an old mine, head up the Bonanza Trail ten minutes away, south of Welches. Don’t trip! 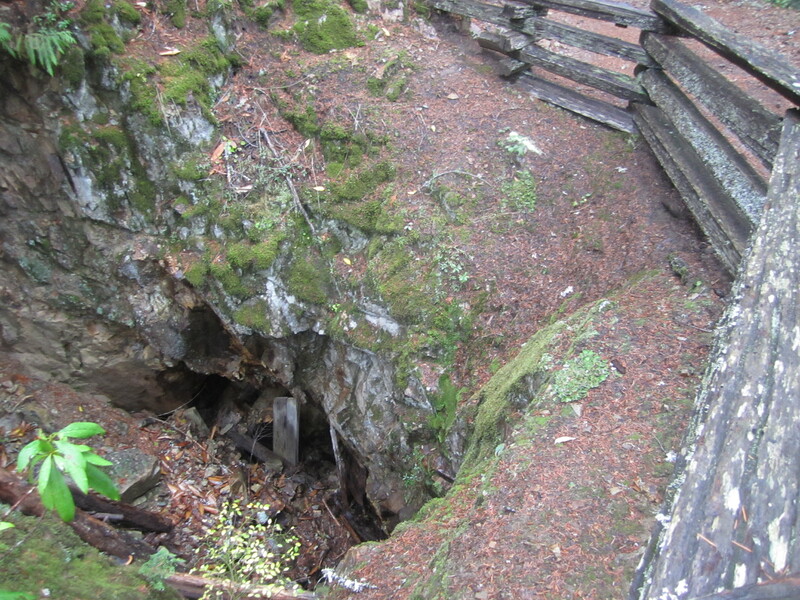 Old mineshaft along the trail. 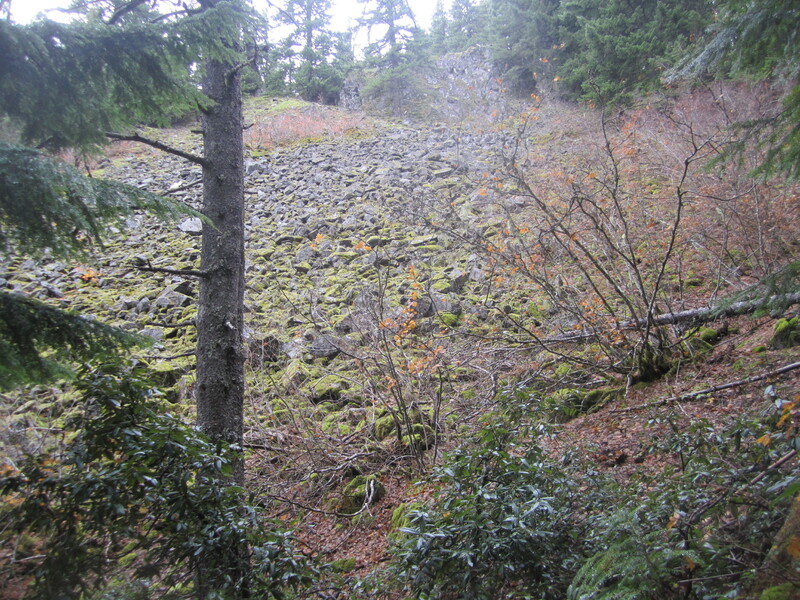 Beyond the mine, the trail dips slightly, crossing a nice mossy rockslide capped by cliffs. The top of the cliffs are an easy scramble, but I remain on the trail this time. There is no view to be had today. 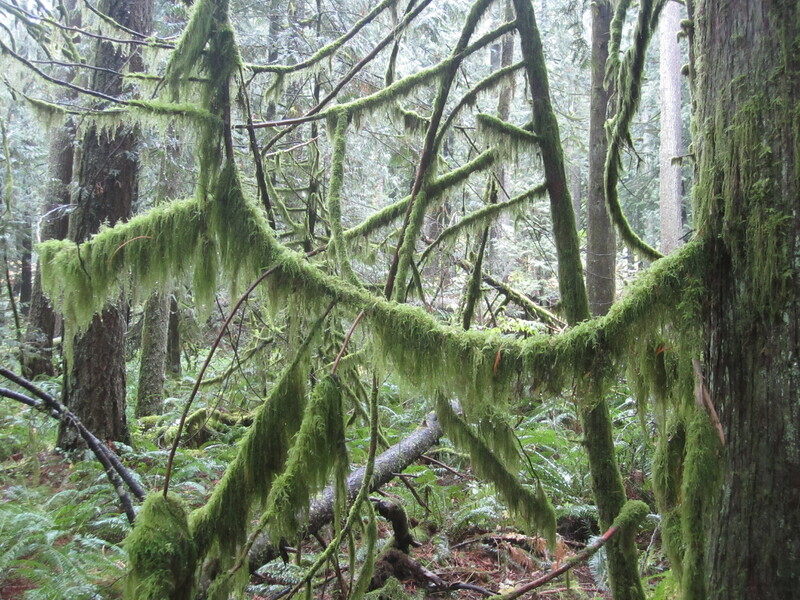 Further on, the trail gets into denser, darker woods, with plenty of Douglas Firs and Western Red Cedars, along with Vine Maples in the open areas. 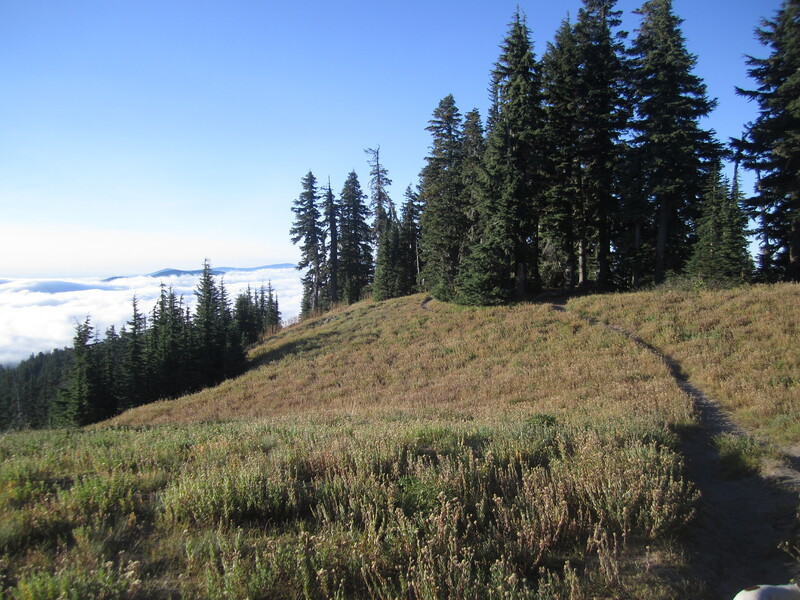 I reach a saddle and bushwhack to a favorite secret open spot above the trail. I call it Baker’s Bump. It must look nondescript from afar, but there are terrific views in multiple directions. Today, with the low clouds, the view calls to mind the Smokies or the Misty Mountains of Tolkein fame. It is a perfect topper to the walk. 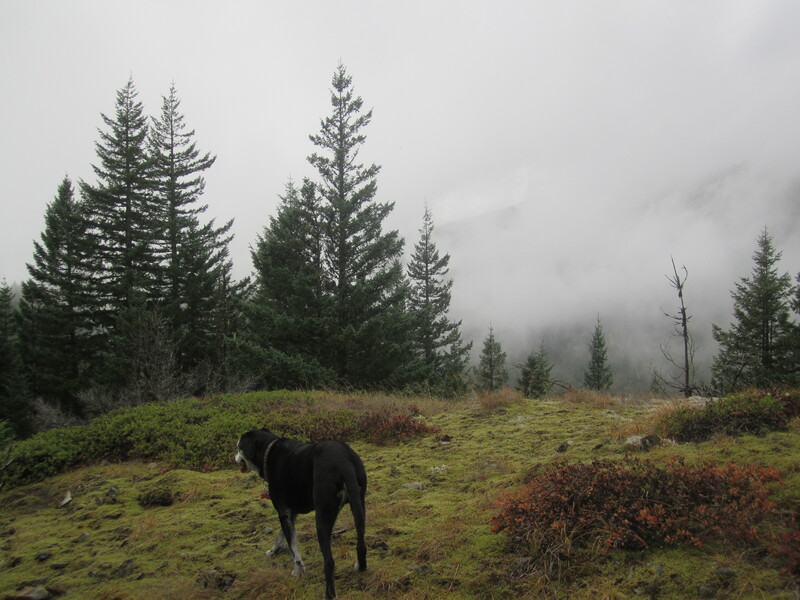 A misty mountain view works for Niko as he sniffs around. I return the way I came and consider visiting the third and final section of the trail next week, headed up toward the town of Government Camp. Green, green,everywhere I see. 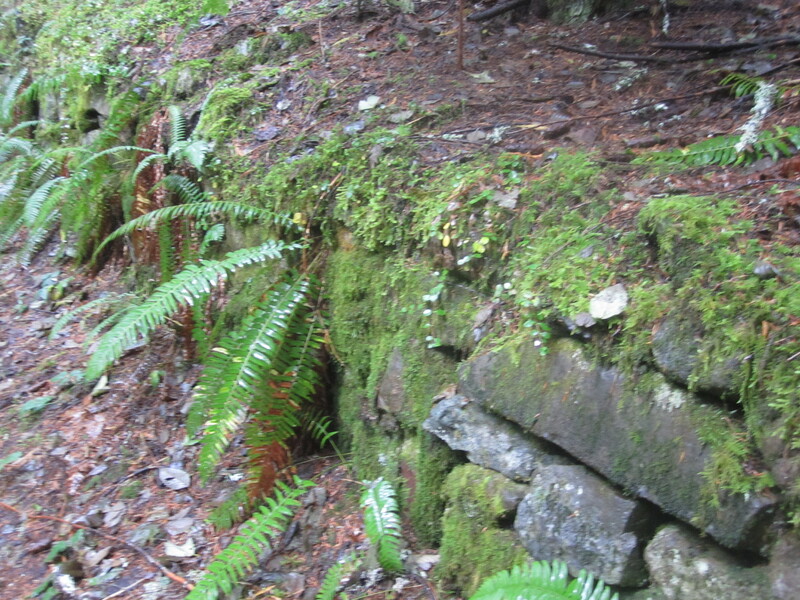 Trailside retaining wall. 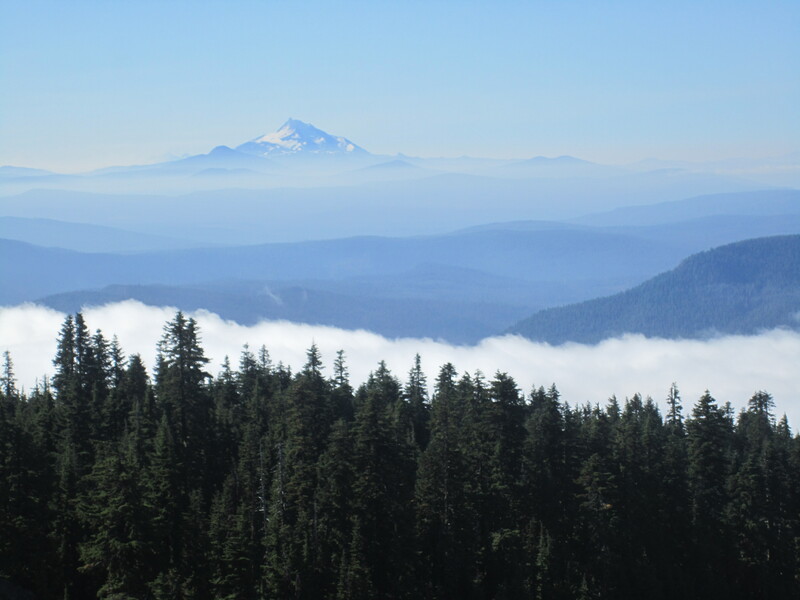 Snow cloaks Mount Hood now; it could be a much more serious endeavor. I could use such a more adventurous hike, so stay tuned!